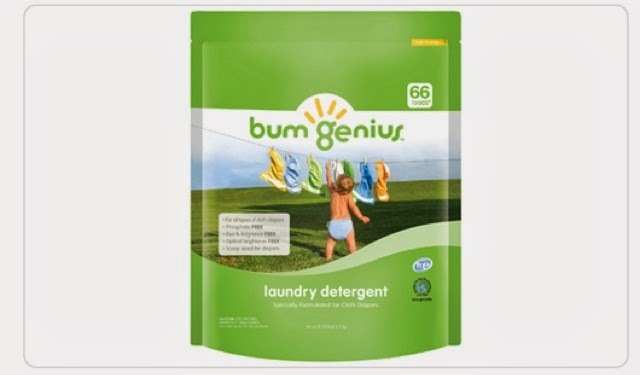 bumGenius™ Laundry Detergent is formulated to keep all types of diapers fresh and clean. This ultra concentrated and biodegradable formula is FREE of phosphates, dyes, fragrances, optical brighteners, animal byproducts, fillers and softeners. Each pouch contains 64 oz of detergent (approximately 71 loads) and includes a scoop sized just right for a load of cloth diapers. If you have really hard water, you may use a little more detergent. For best results, we recommend rinsing your diapers with diaper sprayer before storing them in a diaper pail and washing your diapers every other day. You can rest easy knowing that bumGenius Laundry Detergent is FREE from the harmful additives that are found in many other detergents that can irritate baby’s skin and damage the absorbency of cloth daipers. It is also safe for septic tanks.